Service Integration and Management (SIAM) – the New Discipline? In the last few years Service Integration and Management (SIAM) has emerged as a new discipline in IT Service Management. A large number of vendors are now promoting their SIAM services, with the promise of improving your delivery of IT services. There are however a number of challenges, including: no common understanding of what SIAM is, confusion between systems and service integration, confusion between SIAM and service management, uninformed decisions to outsource SIAM, and a general lack of published best practice. This presentation will help you to address those challenges, build on your expertise in IT Service Management, and help you take the true path to success and enlightenment. Kevin Holland is an experienced speaker on service management topics, with a reputation for providing pragmatic and thought provoking advice in an easily understood way. He has over 20 year’s hands-on experience of applying the theory in a wide range of sectors and sizes of organisations, most recently in the public sector within a service integrator for national services. He is currently driving the development of Service Integration models for the UK Public Sector. 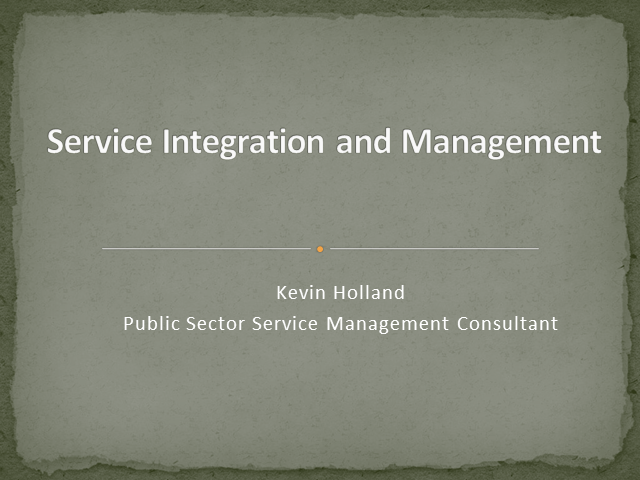 Title: Service Integration and Management (SIAM) – the New Discipline?